Texas Freckles: The first stitches of 2011. The first stitches of 2011. I hope that you and yours had a lovely holiday season and are enjoying the new year. I've been a dangerous combination of lazy and busy, accomplishing almost nothing creative in the past month or so. Would you believe I can't remember the last time I bought fabric? For shame! My UFO pile has grown to monstorous portions, so it's time I get back in the swing of things. I was invited to join a talented group of girls over at the Bee Hexed In bee on flickr. and made hexagons for the first time in a long while. My right thumb is really out of shape! Speaking of hexagons, I haven't given up on the hexagon charm quilt, but I have to be honest, I really got sick of working on it and it's been intentionally neglected. I need to get it out and take stock of where I am. 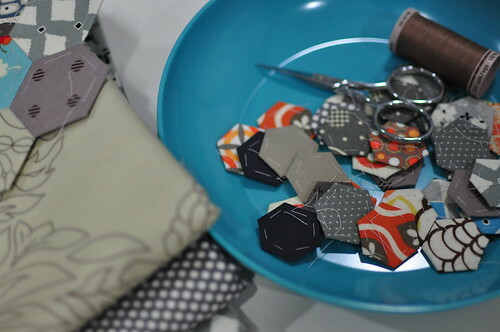 I have more than enough hexagons made, I just need to sew them together. Maybe some longer stitches are in order. Before I go, I want to apologize for not responding to comments and not reading your blogs lately. I've read every comment I've received and appreciate them all, I've just been swamped. You guys are the best! Glad to see you here. Hope your holidays were wonderful. Hexies are great....not that I've made any in a while, but I love doing them. Yes, they are hard on the thumbs, which is why I'm not doing them at present. I am on the last bit of my hexie quilt. I have to say there is no way I could have achieved this if I hadn't stumbled along the group you started on flickr. It really got me back into quilting again after quite a spell of not doing much. I hope you find the enthusiam you need to go back to yours. You've collected a stunning selection of hexies. 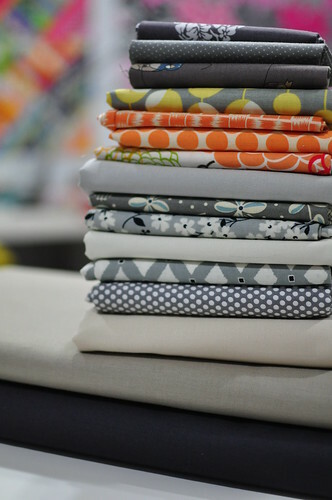 Love the fabrics you've pulled there! Hola Melani, me unido al grupo de hexagonos ya que me encantan, no he realizado nada con ellos...sigo haciendo y ya vere como los uno....abrazos.. I am SEW glad to have you on board with us. this is a very intense block, but oh so much fun. Looking forward to see what you come up with for the group! 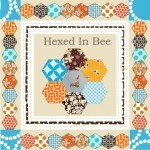 Keep up with that gorgeous hexie charm quilt of yours!! !